Winter in Chicago is a magical time. The city is covered in holiday lights and glittering snow, making for a postcard-perfect scene everywhere you look. That also means there’s plenty of scenic spots to snap the perfect winter photo. So grab your camera (and maybe a scarf and gloves), and head out to these picturesque locales to capture essential Chicago winter selfies. 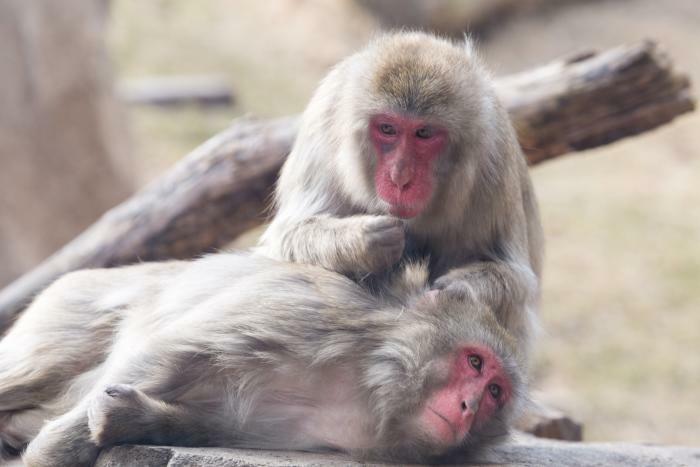 Forget about reindeer, Lincoln Park Zoo is home to an even rarer winter animal – the Japanese Macaque snow monkeys. These fuzzy, playful creatures are one of the few zoo animals you&apos;ll find outside during the winter. That&apos;s because they&apos;re the most northern-living, non-human primates on Earth, making them super equipped to thrive during Chicago winters. Visit the Regenstein Macaque Forest to watch the troop of 12 snow monkeys swing from treetops, splash in their hot tub or play on their habitat touchscreen. The glass viewing area lets you get up close to the tiny primates, so you can get that shot with a snow monkey perched on a snow-covered tree. Any time of year, Hyde Park’s Promontory Point in Burnham Park is one of the city’s best kept secrets for stunning skyline views. But this man-made peninsula serves up real magic when the lake and skyline are adorned in frosty beauty. The lakeside park is less crowded during winter, so you’ll have plenty of time to pose for the perfect winter photo with an icy Chicago skyline. Promontory Point, 5491 S. Shore Dr.
Millennium Park and its iconic Cloud Gate (better known as “The Bean”) sculpture draws visitors from around the world. And each November, these landmarks transforms into a winter wonderland. The free McCormick Tribune Ice Rink lets visitors skate in the shadow of The Bean, dusted with snow and reflecting the holiday lights from Michigan Avenue. 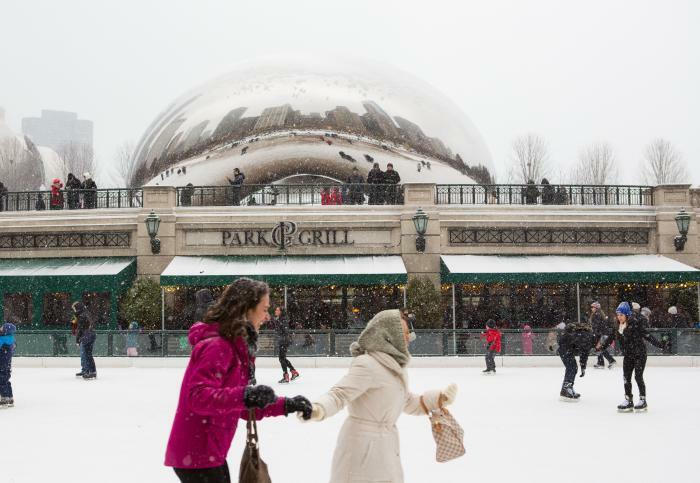 Snap a pic on the ice, or head up to the park for a classic selfie in The Bean’s reflective surface. McCormick Tribune Ice Rink, 1 N. Michigan Ave. It doesn’t get more classic Chicago than grabbing a photo with the Art Institute of Chicago lions. 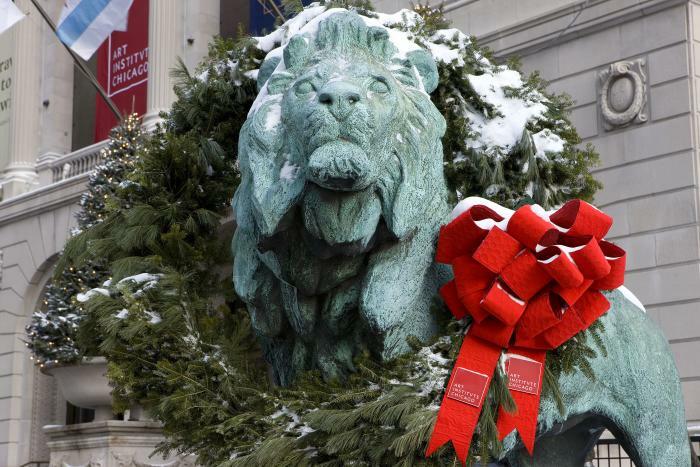 These iconic bronze lion sculptures have greeted visitors to the museum since 1894. But from Black Friday through January, these feline beauties get a festive look when they’re adorned in giant holiday wreaths. Snap a selfie on the steps, then head inside the Art Institute to warm up and explore their world-class art collection. 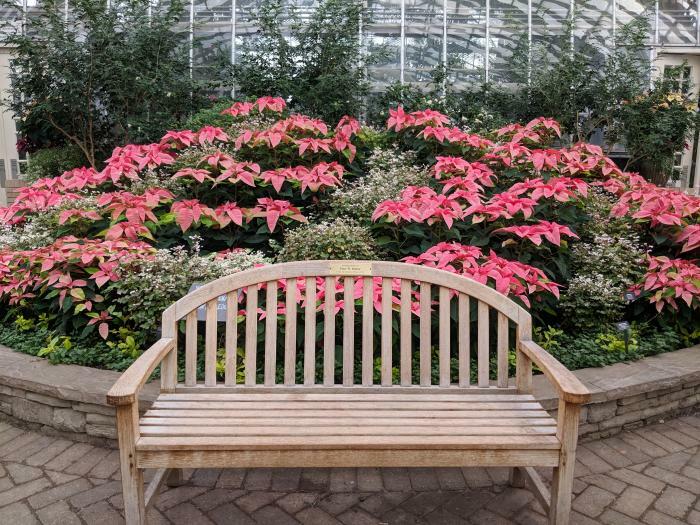 The warm greenhouses of the Garfield Park Conservatory are the perfect place to defrost on a snowy Chicago day. It’s always a treat to stroll through the two acres of lush tropical landscape, but the experience is even more stunning when you glimpse icicles and snow just through the windows. The annual Holiday Flower Show ups the ante with a dramatic arrangements of flowers and holiday displays. This year’s show has the theme of “Tickled Pink,” with rosy poinsettias and a sugar plum dream display. Dress in a vibrant color for contrast in front of a stylish backdrop of blush blooms. Once the temperatures drop, the crowds clear out and the wonderful winter panoramas set in at the Chicago Riverwalk. Head down the steps to pose for a selfie along the frosty river with the city’s iconic bridges and skyscrapers all around you. If you prefer to stay indoors, hop an Odyssey Riverfront Dinner Cruise that set sail all winter long. 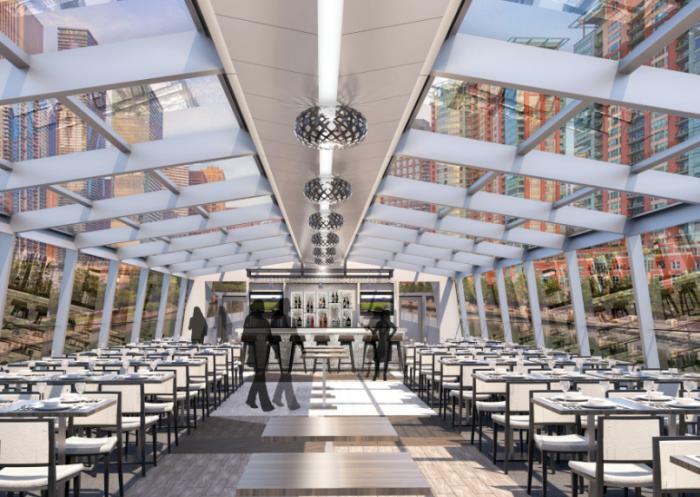 Their brand new, all-glass boat ensures you’ll get the perfect shot of the lit-up cityscape.Chicago Riverwalk, 400 E. Lower Wacker Drive.